We present a study on the impact of the limited capacity of backhaul links on user scheduling, and user association in a heterogeneous cellular network. We show that the backhaul limitations have a critical impact on user scheduling, but a minor impact on user association. We propose backhaul-aware user scheduling schemes that are computationally simple and hence easy to implement, and yet can perform very well. We also propose online backhaul-unaware user association rules that are very efficient. These results are significant since they impact the way base stations and user equipment should be designed. 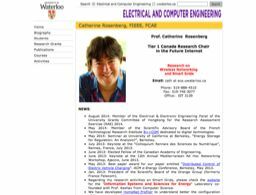 Bio: Catherine Rosenberg is a Professor in Electrical and Computer Engineering at the University of Waterloo. Since June 2010, she holds the Tier 1 Canada Research Chair in the Future Internet. From 1999 to 2004, Prof. Rosenberg was a Professor in the School of Electrical and Computer Engineering at Purdue University. Prof. Rosenberg is the President of the Scientific Advisory Board of Orange.She was elected an IEEE Fellow for contributions to resource management in wireless and satellite networks on 2011 and a Fellow of the Canadian Academy of Engineering in 2013. Her research interests are mainly in three areas: the Internet, Wireless Networks, and Energy Systems.